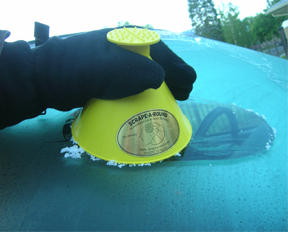 Battle Windshield Ice with the Scrape-A-Round ice scraper! Living in Wisconsin, it is not uncommon to spend a good portion of our mornings scraping windows and trying to see out the windshielf of our cars after an icy evening or snow filled day! I don't know about you, but using an ice scraper is among the list of my least favorite things! 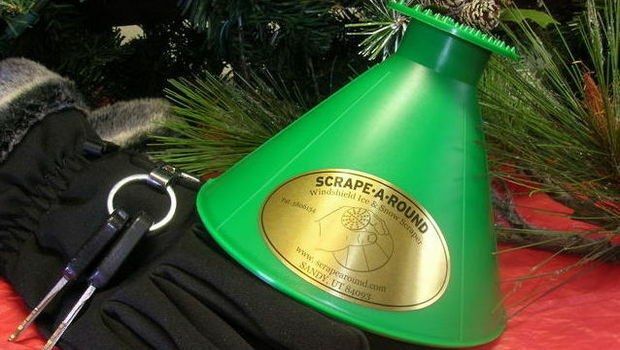 If you’re tired of scraping your windows the old fashioned way, then join the Scrape-A-Round movement. You will secure your family’s safety, access new gift ideas and scrape your windows cleaner in half the time with the world’s best windshield ice scraper. The Scrape-a-round is a brilliant feat of ice scraping engineering. It is safe – even for kids to use and makes use of a lot of smart ideas to make quick work of icy windshields. The one downfall is for someone like me with stubby arms – getting to the direct middle of my giant SUV was tricky – but for hubby that was no problem because he has long arms! Best ice scraper because of the softer plastic, allows the scraper to conform to the window curvature! Our winter has been somewhat mild this year, but the Farmer's Almanac says I should prepare for a colder February and March – I'm glad I'll be ready with the coolest ice scraper around! « 3DLightFx – Fun Light Gift For Kids!